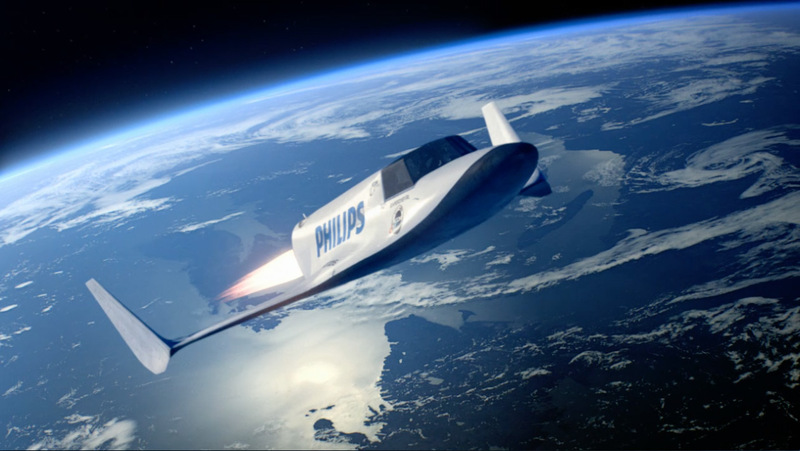 Mill+ director Russell Tickner worked with the 3D team to create a zero gravity environment, demonstrating how perfect your shave can be with the Philips 'Zero G's' 'contour detect' technology. The opening sequence of the ad was created fully in CG, with the shuttle based on CAD data from the LYNYX XCOR Suborbital spacecraft. The sequence uses 360 degree still images, which were then mapped onto a 3D model to give the final photo-realistic result. Director Russell Tickner comments, "At first glance a green screen shoot was the obvious solution to re-creating the experience of space travel, however the various regional versions multiplied the scale of the production, and this afforded us the opportunity the build vehicle interior and to shoot the commercial almost completely in camera. To create the impression of weightlessness we used Motion Control to move the key lighting and pneumatic rams rotated the whole set while our actors where suspended from wire rigging. All of this effort allowed to light and compose our scenes in camera, framing the action with drifting cameras passing through natural lighting flares." The live action footage was comped seamlessly onto CGI plates with the 2D team's work including rig removal, set extension and the space environment build.